Thousands of Organizations Have Used the Professional Version of BaFa’ BaFa’ to Create Awareness and Move to Action! Interactive, Engaging, Effective and Safe – the Professional Version of BaFa’ BaFa’ is what your Cultural Awareness/Diversity training program needs. 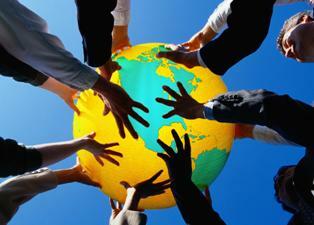 Build awareness of how cultural differences can profoundly impact people in an organization. Motivate participants to rethink their behavior and attitude toward others. Allow participants to examine their own bias and focus on how they perceive differences. Examine how stereotypes are developed, barriers created, and misunderstandings magnified. Identify diversity issues within the organization that must be addressed. In BaFa’ BaFa’ participants come to understand the powerful effects that culture plays in every person’s life. It may be used to help participants prepare for living and working in another culture or learning how to work with people from other departments, disciplines, genders, races, and ages. It is a time tested face to face simulation training program that creates memorable experiences and gets results. The Professional version of our world class cultural awareness/diversity simulation is designed for the training professional to use right off the shelf. Our Directors Kit has all the learning resources and step by step instructions to run the program successfully. The participant materials are presorted and set up specifically for your training. We’re glad to offer phone support, we’ll help you with any questions you have. BaFa’ BaFa’ initiates immediate, personal change. This simulation makes participants personally aware of the issues around cultural differences. Participants feel the alienation and confusion that comes from being different. BaFa’ BaFa’ shakes participants out of thinking in stereotypes, they learn the value of all faces in the workplace in a safe, stimulating environment. A Reusable Directors Kit with everything needed for the facilitators portion. One set of participant materials for each person going through the program. So for example, if you’re planning to conduct a training session for 30 participants, you’ll need to have one Directors kit and 30 sets of participant materials. The participant materials include all of the materials each person needs to participate in the simulation and are consumable. If you would like to run the program again, you can reuse the Director's Kit, but will need to purchase new participant materials for each person going through the program. The materials are always available and usually ship the next business day after we receive the order. We prefer to ship via DHL or UPS and it usually takes between 2-5 working days to arrive in most parts of the world. Participants develop a set of guidelines to help them work more effectively in a culturally diverse environment. In addition, participants take away an action plan for adapting to a work culture when he or she is the one who is different, and an action plan for coaching and working with people who are different. Participants become aware of how profoundly cultural differences can impact the behavior of people in an organization. Participants gain insight into the way stereotypes are developed, barriers created, and misunderstandings magnified. Participants are provided with a safe vehicle to discuss the ways cultural, physical and racial differences affect others as well as themselves. Participants identify diversity issues within the organization that must be addressed, then create a plan for developing the potential of a diverse workforce. How have organizations used BaFa’ BaFa’? Experiential training is memorable and cost effective. Build awareness for any groups with differences (not just for diversity). Reinforce the positive aspects of cultural diversity. Prepare employees for overseas assignments. Build sensitivity towards cultural differences within the workplace. Introduce corporate culture to new employees. Help employees adjust during mergers or right sizing. Encourage discussion between groups who’ve never worked together. Stand-alone experience to increase insight into culture/diversity issues. Module for selling to different cultures. Diversity awareness training that identifies issues surrounding communication skills, sexual harassment, gender differences, effects of power, aging workforce, disabilities, cultural differences. Supplement to orientation programs, organizational development programs or diversity task force programs. Method for gaining buy-in and support for the company’s diversity effforts. Module in a team building course. What happens in BaFa’ BaFa’? After an initial briefing two cultures are created. The Alpha culture is a relationship oriented, high context, strong in-group out-group culture. The Beta culture is a highly competitive trading culture. After the participants learn the rules of their culture and begin living it, observers and visitors are exchanged. The resulting stereotyping, misperception and misunderstanding becomes the grist for the debriefing. In the simulation portion of BaFa’ BaFa’ we create a problem for all of the participants. We require them to live and interact in another culture. We then ask them how they felt when they were in the foreign culture. They generally report feeling lost overwhelmed, invisible etc. We then ask what strategies they adopted to cope with those feelings; they report such behaviors as trying to escape, discounting the other culture, dropping out psychologically, insulting them, etc. At this point, we explain that in the simulation we were starting the process of developing traditions for the Alpha and Beta cultures. In other words, their strategies for coping will soon become ways that the people from their culture will use to interact with people from different cultures. If we were to focus on these cultural differences it would make it more difficult to relate to other cultures. However, if we were to focus on how these cultural traditions developed, i.e., people in our culture were trying to learn how to feel welcome, competent, and valued when interacting with another culture, we would then draw closer together. The next step is to teach them non-defensive ways of asking about cultural practices and the problems those practices were designed to solve. We then discuss the assumptions of the diversity challenge. We draw a Venn diagram and present the assumptions of the diagram. Everyone is bicultural or multi-cultural. Each employee belongs to the culture of his or her birth and heritage and also is a member of the corporate work culture. 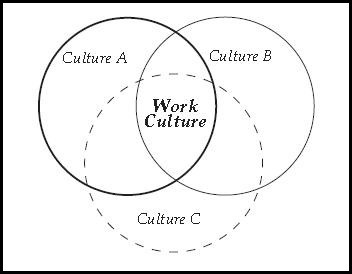 The culture that a person inherits from his or her home i.e., culture A, B, or C, cannot be changed or modified by the work culture. The bringing together of people from diverse cultures into a work culture can create major benefits for the individual and the corporation. The challenge for the people within the corporation is to shape the vision, values, and practices of the work culture in a way that produces these benefits. We then teach them a technique for weighing the different approaches against the values of their own culture and identifying those practices that are not compatible with the corporate culture, those that are neutral, and those that support and encourage the organization’s values. The final step is to identify ways of reinforcing and encouraging those cultural practices that are different, and also support the organization’s values. Organizations big and small use BaFa’ BaFa’ to reinforce the positive aspects of cultural diversity, to prepare employees for overseas assignments, to build sensitivity towards cultural differences within the work place, to introduce corporate culture to new employees, to help employees adjust during mergers or right sizing, discuss conflict management, or to encourage discussion between groups that have never worked together before. See a list of customers who’ve used our Professional Version of BaFa’ BaFa’. When used as a diversity tool, is the emphasis on compliance, “the shoulds”, or the bottom line? The whole point of the BaFa’ BaFa’ experience is to help participants understand that having a diverse work force contributes to the bottom line of the organization in very direct ways. BaFa’ BaFa’ is based on the assumption that cultural differences develop because different peoples have invented different ways of solving common problems. This assumption seems fairly obvious when considering the differences in something as basic as our languages. Learn how to develop and sustain the tremendous value that differences can create for an organization. Other differences are not so obvious. The distance we stand from another person when speaking, proprietary attitudes about personal space, relationships with superiors and subordinates, the way men treat women, and whether one views rules as absolute or relative: all reflect ways that various cultures have solved problems. In many diversity programs, as well as those designed to train people to go overseas, we have identified differences-then tried to get people to tolerate those differences. Emphasizing differences, even when we try to teach tolerance of those differences, often causes hostility, creates greater distance and greater misunderstandings. Presenting our cultural differences as a reflection of the way we solve similar problems promotes a sense of our common humanity. We then begin to realize that we are all in this together, and that we all have to face similar challenges. Instead of looking upon cultural differences as things to be tolerated, we can relate to each other as cultural problem solvers. Understanding this basic notion allows us to view cultural differences as a rich reservoir of solutions to real world concerns. Solutions that will directly improve the bottom-line. This is the basic approach of BaFa’ BaFa’, in that we create a problem for everyone in the simulation. We require them to live and interact in another culture. Then, we ask them how they felt in that culture. The answer is always the same: they felt lost, confused, invisible, etc. Then we ask how they responded to those feelings; in other words, how did they solve the problem? Some withdrew, others got angry, some wanted revenge, while others totally discounted the other’s cultural values. At this time, we point out that if we focus on the solutions to the problems, i.e., withdrawal, anger, revenge, and cultural discounting; our differences appear greater. However, when we discuss the common problems that we faced, i.e., how to feel welcome, competent, and valued when interacting with another culture, we then draw closer together. The next step is to identify the solutions that people have developed in their own culture and evaluate them against the corporation’s values. The final step is to identify ways of reinforcing those cultural practices that support the organizations values. BaFa BaFa initiates immediate personal change that benefits the entire organization. BaFa BaFa is ready to use and we offer free phone support. Order now or contact us with questions! What is the minimum and maximum number of participants for BaFa’ BaFa’? It requires a minimum of 12 participants. It works best, however, with 18 to 35 participants. It has been played in groups as large as 300 with special accommodations. The professional version of BaFa’ BaFa’ can be run in 3 hours, but is suggested as a strong half day training program. Specifically the “simulation” portion takes approximately 1 hour and 15 minutes, approximately 45 minutes for a basic “Data Collection” portion, then bringing the learning’s back into the workplace takes about 1 – 2 hours, depending on the stated goals of the training. The Professional version of our world class cultural awareness/diversity simulation is designed for the training professional to use right off the shelf. The Director’s Kit has everything the facilitator needs, including step by step instructions for setting up, running and debriefing the program. It includes audio cd’s, powerpoints, detailed diagrams and step by step instructions for discussing the experience and bringing the learnings back into the workplace. Everything the participant needs is included in each set of participant materials. Each set includes a workbook, artifacts for their culture, a variety of discussion questions, conclusions and insights by participants, ways to help a person who is different adjust to their work culture and hints for adapting to another culture. We’ve even presorted all of the visitor materials for you. All you need to do is tell us how many people are going to be in your training session and we prepare everything for you, this makes it easy to set up and use the materials once you are at the training facility. We’re here to help, whether you have pre-sales questions or you’d like detailed information on running the program for your group, we’re glad to spend as much time on the phone as you need to help your training be a success. What materials do I need to offer BaFa’ BaFa’ training? The facilitator needs a BaFa’ BaFa’ Director’s Kit. The Kit includes all of the materials needed to facilitate including director and assistant training guides, Alpha and Beta culture audio CDs, and an orientation wall chart. Each participant needs a set of participant materials which contain all the cultural artifacts and discussion questions. The participant materials are sold separately. Power of Leadership teaches leaders how to use power to resolve conflicts, communicate effectively, solve problems, and manage positive change in the corporate culture. Learn More. Pumping The Colors® team members understand at an intellectual and a visceral level what must be done to build a high performing team. Learn More. StarPower® participants are eager to discuss the normally taboo topic of power and how it can be used to create trust and commitment instead of distrust, anger and apathy. Learn More. BaFá BaFá® helps participants understand how culture affects each person’s behavior and what is required of each person to live or work with people who have different values, work styles, and world views. Learn More. Where Do You Draw the Line? helps participants understand the actual principles that most people use to make ethical decisions. We often customize this simulation to target specific ethical issues. Learn More. Our client is a state university medical school. Their challenge is to introduce the concepts of multiculturalism to entering medical students during their week of orientation with very little time and create enough of an interest to lead them through future offerings during their medical school career. BaFá BaFá is the product of choice and has been working for the client for 7 consecutive years. HLC, Inc. provides facilitation services in three general arenas. Learning through experiences such as simulations (non-computer based), conflict resolution through mediation, and boar and retreat coordination and management. http://www.hlcinc.com. I have been conducting BaFa BaFa for more than two decades. The various context have included, diversity and multi-cultural experiences to improve the cross-cultural understandings and context of the people with whom I implement BaFa BaFa. I have implemented the simulation with Federal, State and Municipal government agents,Boards of Education, teachers and administrators, elementary, secondary, post-secondary and vocational students and parents, churches, community-based organizations, large corporations, and small businesses. I have worked with people of all cultures, socio-economic, and educational levels, without one instance of anything short of phenomenal. Participants are amazed at what they learn about themselves and are able to apply to their relationships, careers, businesses, and organizations. Any profession that deals with people will benefit from the experience of better understanding themselves, their perceptions and perspectives regarding “different others,” People, laugh, cry, share, share grow and apply this experience to their interactions, decisions, views of the world, life and work. Mitch Shirts is the best, available, accessible, and always willing to work with you in achieving your goal. A program of which the goals and objectives are achievable,and the outcomes are always exemplar. I will add some of the participant comments for your review. How did the project benefit the individuals who attended, your community, or organization? Everything, I will never be able to say a negative thing about some other group or individual without thinking about the lessons of today, and re-grouping. Recognizing, and opposing prejudicial thinking. I am encouraged that so many people care about making things better. Do not pre-judge individuals base[ed] on their differences? •	This program is something that municipalities, corporations and governments fly you in to do. •	It was marvelous, your instincts are perfect, and I have attended others diversity conferences, this is the best I have ever seen. •	I enjoyed myself; it really gives you an opportunity to think about yourself. •	Never saw anything like it, it was awesome. •	This is as good as its gets, it my humble opinion. •	I appreciated some of the responses people made. •	The most enlightening part for me was how could actually see your own behavior, and that of others. •	Every community in Hartford was represented, that was great! •	Everything was very well done. •	It is something I would go to again. •	I have not been to a conference this valuable in twenty years! •	Your team was unbeatable, just wonderful facilitators. •	Black/White thing gets overdone, this was a good thing about it, it was about everyone, and everyone was equal and together. •	I liked it was more of a refresher, I have been in other diversity groups, this helped me to remember things I have learned, the whole experience was good. Pat, thanks so much for putting the day together and inviting me to be part of it. It was a really rich, rewarding day. Thanks to John and everybody else involved too. •	I was amazed by the fact that people from different communities were all of the same accord, no negativity. •	This is a really fabulous thing, everyone should go through it! •	I thought it was fantastic, I have been to diversity conferences, some good, some bad, I expected the usual discussion, but this was totally on a different level. •	I noted that the groups became quickly frustrated with one another. This is really close to real life. I would love to have a follow-up with the people. •	It changed my mindset, and made me really think about how I deal with other people. •	I just wanted to thank you for including me, I learned so much today. •	Everybody was represented; white, black, Hispanic, poor, well-to-do, people doing well, people not doing so well, gay people, people with disabilities, professionals, laborers, unemployed. Sounds like you’ve had your BaFa’ BaFa’ kit for a long time, that’s great! Yes, we’ve converted the cassette tapes to audio cd’s years ago and we have them available for sale. The easiest way to order them is over the phone. You can call us between 8:00am-3:30pm Pacific Standard time at 858 450-3400. We hope to hear from you. I just wanted to say thank you for your help and for the program. My first simulation (BaFa’ BaFa’) was today and it went over with rave reviews. I will continue to use the program to increase awareness. Thank you!